Opens: I refuse to speak to a man” Lady Harriet sat before him –composed and pale. Blurb: Set against the backdrop of WW1, Mayfair 100 is the telephone number for a small specially-formed crime busting team based in a house in Mayfair. London, 1915. Just 10 months into the First World War, the City is flooded with women taking over the work vacated by men in the Armed Services. Chief Inspector Peter Beech, a young man invalided out of the war in one of the first battles, is faced with investigating the murder of an aristocrat and the man’s wife, a key witness and suspect, will only speak to a woman about the unpleasant details of the case. After persuading the Chief Commissioner to allow him to set up a clandestine team to deal with such situations, Beech puts together a small motley crew of well-educated women and professional policemen. As the team work secretly to investigate the murder, they delve into the seedier parts of WWI London, taking them from criminal gangs to brothels and on to underground drug rings. Will the Mayfair 100 team solve the murder? And if they do, will they be allowed to continue working as a team? 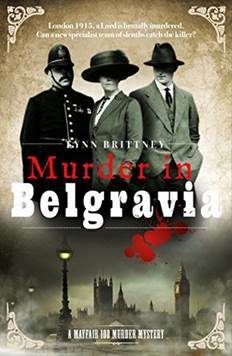 My thoughts: MURDER IN BELGRAVIA has to be the best Historical Mystery I’ve read in a long time; and I learned so much! I mean who knew that London was bombed by airships – in WWI? OK – so my husband did – but he’s odd – I found myself surfing the net for many happy hours delving into this part of history that I didn’t know about once I had finished reading the book. I love it when I am entertained and educated. The story starts with the murder of Lord Murcheson. His wife, Lady Harriet, is the prime suspect, she refuses to talk to Chief Inspector Peter Beech, the assigned investigator, because he is a man. She tells him she will only speak to a lady. He doesn’t push the issue as he sees that she is seriously injured. He very quickly gets her to hospital where a female friend of his, Caroline Allardyce, is a doctor. Caroline tries to talk to Lady Harriet but it turns out she won’t talk to just any woman – she will only talk to someone who is her equal in society. Peter asks a close friend the widowed Lady Victoria Ellingham to travel to London to talk to Lady Harriet. At this point Peter notes a huge gap in police investigation capabilities, he needs women recruited. Peter gets permission to create a small, secret and very much unofficial investigative team. He recruits Caroline, and as Victoria is legally trained Lady Victoria he adds her to the group. To these ladies he adds PC Billy Rigsby, a wounded war veteran and very popular with ladies even though unaware he is, and Detective Arthur Tollman – father of 4 girls, so well able to work with women. Caroline quickly assesses that with the injuries that Lady Harriet sustained there is no way that she could have been in any condition to kill her husband. So the chase is on to find out who did kill him. Harriet’s husband, Lord Murcheson, had returned seriously injured from the war, and the treatment had turned him into a rampaging brutal drug addict. The team set to work on finding out what the drugs were, who supplied them and where have the missing Butler and Lady Harriet’s maid gone. Lynn Brittney takes us deep into WWI London, we meet Gang leaders, prostitution rings, white slavers, drug dealers, Molly houses (another new term for me), and gambling dens. Suspects, and witnesses, range from the elite of society to gutter rats, and the team grows as different leads are followed. Lady Victoria’s mother supplies her Belgravia home as a base in Mayfair, Billy’s mother and aunt are set up in Lady Harriet’s house when their home is bombed, and through Caroline a female chemist comes on board to help with the crime investigation. The setting is war torn London, with the men off to war, and coming home physically and mental shattered. Women are moving into jobs that they have never had a chance to do before. Society is changing but there is a lot of resistance to women working as their roles shift from housewives to workers. As a group I loved all the main characters, they worked together, taught each other and lent a hand to assist those in need. They seemed real, and all had empathy as each of them were carrying baggage. One of the minor characters, who had major impact on me, was a young lad named George, I shed a tear over what he had to go through. The dialogue was good, the information was interesting and not superfluous at any time to the story and as for the portrayal of everyday life, I was blown away by the fact that heroin, morphine and opium could be purchased at any pharmacy for minor complaints such as toothaches, infant colic, and as nerve tonics. Rating: Excellent Stuff– a real page turner and hard to put down. I carved out extra reading time just so I could finish it. This book got carted into the bathroom with me, read over meals, read at work, and/or kept me up late at night. If this author has more work, I will certainly read it. With thanks to the author Lynn Brittney for my copy to read and review. Opens: The woman’s heart was pounding in her chest, her legs ached from running but she knew she could not stop; the child was hidden and safe for now. Blurb: The year is 961 and King Harald Bluetooth of Denmark has his gaze firmly set on the Western Kingdoms of Norway where his nephew Harald Greycloak reigns. Bluetooth has declared Greycloak as his vassal King of Norway and will claim the establishment of the Jomsvikings. In doing so he will solidify the order, building a keep for the warriors he intends to use to create a fleet of men who will rule the seas under his command. However, the order is older than one man’s claim and consists of many who have their own destinies separate from the feuding monarchs. There are men of honour and worth and there are those who seek naught but power and privilege, searching only to prosper from the misery of others. There are tales of a legendary ring and a child who is said to be the progeny of the All-Father. 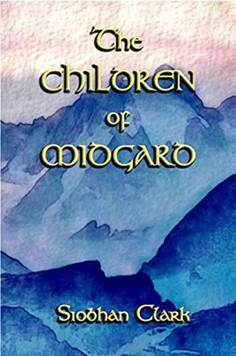 My thoughts: I really enjoyed my time spent with the Vikings in CHILDREN OF MIDGARD. In real life Vikings were quite an incredible race of people and I love watching documentaries about how they lived. They were just not marauders, though that was a large part of how they lived in the summers, but in the winters they settled back on their farms and became normal citizens. They were a seafaring people, explorers and traders but had internal political struggles same as any nation then, and now. CHILDREN OF MIDGARD is set against one of these struggles – that of King Harald Bluetooth of Denmark and his Norwegian nephew King Harald Greycloak. The story opens with a woman running away from some men who are trying to capture her and a young boy. Liv, known as the Guardian, has hidden the boy and tells her captor that he is dead. Her captor turns out to be a childhood friend Ari and instead of taking her off to Jarl Brynjar as he has been commissioned – the evil baddie of the story, Ari whisks her away to safety. Of course, as this is in the first couple of chapters, you just know that safety is going to be a relative thing. What follows is a beautifully written, amazing adventure which has action, betrayal, danger, madness, bravery, love and friendship. The day to day activities of the Viking people is depicted very well – both for the fighters and the civilian population – the settings had me reaching for google to try and find Scandinavian rural pictures. Life was hard – but families and friendship and faith sustained the average citizen. B – Great – I really enjoyed reading it and it is a book I will be recommending to all my friends who like these genre. With thanks to the author for my copy to read and review. 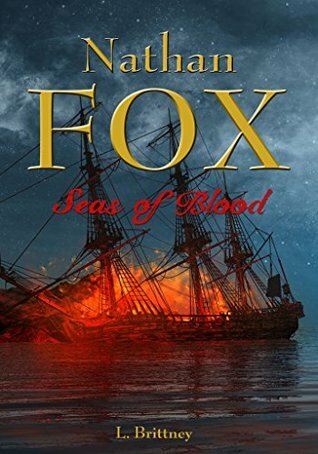 Blurb: "Miss Isobel Clara Macleod, youngest of the seven children of Major Sir Angus Hutton Macleod, Surveyor-General of the colony of New South Wales, had the singular misfortune to know that at seven o’clock that morning her father was going to die." In September, 1851 Sydney is a city of secrets and gossip. Seventeen-year-old Isobel Macleod is determined to save her father because she loves him. But when she dares to trespass in a forbidden male world, she will be plunged into social disgrace. A wave of ill fortune threatens to swallow up her family and their stately home, Rosemount Hall, ‘the finest house in the colony’ on the foreshores of Sydney Harbour. But is Isobel to blame for her family’s fate or does the cause lie further in the past? A daughter sacrifices her reputation, two men bid for the love of a woman, freedom is found in the heart of a dust storm, a father’s legacy reveals past crimes. Inspired by Elizabeth Bay House and the other grand villas of Sydney’s Woolloomooloo Hill, The Opal Dragonfly tells the bittersweet story of an ambitious family’s fall from grace and a brave young woman’s struggle to find her true self. My Thoughts: I generally try to avoid books that are over 400 pages, so for me to gleefully jump on a book that has almost 600 pages is a big indication as to how much I was looking forwards to reading this latest book by Julian Leatherdale. I had very high expectations let me tell you as his first book PALACE OF TEARS was my joint book of the year in 2015. Julian Leatherdale did not let me down!!! THE OPAL DRAGONFLY starts off very innocently, Isobel decides to save her father from certain death and rushes off at dawn dressed up as a boy to stop a duel. This is not the last headstrong idea that Isobel has, in fact she has tragedy upon tragedy heaped upon her young shoulders. As the story unfolds she often jumps first and asks questions later. Her story is quite dark and tragic, but is never, ever, depressing. Quite the opposite, I was glued to the story as secrets, rejection, deceit, jealousy, madness, betrayal and death after death after death swirled around her. The tragedies started after her mother was given a dragonfly shaped brooch made of opals. Isobel was given the brooch by her mother just before she died and she was told to keep it hidden and not give it to her sister Grace who coveted it. Isobel was also told to throw the brooch into the sea if ill-luck befell the family. Something she was reluctant to do – even once the nightmares started and fortunes changed she hung onto that damn (or was it damned?) brooch. Sydney in the 1850s came alive on the pages – fiction interlaced with fact gave credence to the story’s setting. While the main characters are fictional they are based on real people and the activities such as exploration, cruelty to Aboriginal peoples and the poorer members of the community is not glossed over. Isobel’s story, gothic in tone, is slowly built up against the backdrop of an evolving city and society, culminating in an edge-of-the-chair horrifying event that left me stunned, before a complete change of pace and reflection ends the story. Not one of the support characters was superfluous to the story – some are there for good, some are there to muddy the waters or ensure harm is done – the reader just has to figure out the truth. An extremely hard thing to do when everyone at some stage lies or hides the truth. Even our young heroine. Julian Leatherdale, you have now got yourself a new fangirl – or should I say a fan nanna!!! Can’t wait until your next book. Opens: So there she was. Blurb: In 1876, Louise St Quentin is sixteen. She is an orphan and the rich owner of a huge estate. Her future seems all mapped out; a marriage of convenience which would help her manage her estate. But Louise listens to her heart rather than her reason. 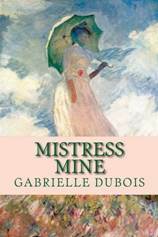 The end of the 19th century is terribly exciting, and Louise wants to discover everything – the adventure lying at the end of the railway track, romantic music, the modern cuisine in the new Parisian restaurants, and impressionist painting. Will her artistic, cultural and sensual upbringing going to lead the young girl to her ruin or to love? Will Louise, the young French girl find the grass greener on the other side of the world? My Thoughts: Louise St Quentin, the main character, is utterly gorgeous, adventurous and manages to retain her air of innocence even after she has lost it. Her upbringing is very unconventional; her mother dies at birth, father rejects her and her eight-year-old brother goes back to his boarding school, never comes home for the holidays and then disappears completely once he reaches adulthood. Louise is brought up, as best they can, by a serving woman and her husband, but she is completely unaware of society expectations of young ladies and is very much a free spirit. This is first demonstrated after her father dies and Louise travels to Paris to find her brother. She arrives at the house of her brother’s best friend unannounced. This is where the story had opened – her on the doorstop – but to get back to this point I found it a little confusing with characters being introduced and disappearing at bewildering rate. I confess to almost putting the book down – but at that point we got back to the doorstep again and Louise’s adventure started in earnest and I was swept into it. In Paris she is quickly seduced by the first of a few men in her life – all are kind to her and help her and love her. But Louise is not ready to settle down as there is a constant urge for her to follow something, only she is not sure what. From Paris she dithers between the city and her country home before she finally makes a decision and travels to a Polynesian island and from there to Australia where she finally feels that maybe she can settle. However there are still a few more twists and turns to navigate until the end of the book. The settings and scenery come alive on the pages and after the confusing start the story just flows and keeps your attention. Everything from life in France, through to the idyllic lifestyle in Polynesia to on the frontier setting of Sydney via life on-board sailing ships has been well researched. The characters are all well developed and their histories are revealed to Louise, and so to the reader, so you can understand what makes them tick. Even the disgruntled women who instantly dislike Louise because of the interest she holds for their husbands you can see why they are like they are. Louise grows as a person during the book – progressing from a rejected baby, wild childhood, innocent girl in a world of lecherous men and onto become a self-confident, independent, well-travelled and brave woman. C – Above average – was very readable and I really liked it, but was easily able to put it down and walk away for a while. Opens: The storm raged on. In the pitch black, the thunder cracked as a roaring gale whipped through the narrow wynds and filthy closes of Dundee’s tenements. Blurb: At 7 p.m. on 28 December 1879, a violent storm batters the newly built iron rail bridge across the River Tay, close to the city of Dundee. Ann Craig is waiting for her husband, the owner of the largest local mill, to return home. From her window Ann sees a strange and terrible sight as the bridge collapses, and the lights of the train in which he is travelling plough down into the freezing river waters. As Ann manages the grief and expectations of family and friends, amid a town mourning its loved ones, doubt is cast on whether Robert was on the train, after all. If not, where is he, and who is the mysterious woman who is first to be washed ashore? In 2015, Fiona Craig wakes to find that her partner Pete, an Australian restaurateur, has cleared the couple’s bank account before abandoning his car at the local airport and disappearing. When the police discover his car is stolen, Fiona conducts her own investigation into Pete’s background, slowly uncovering dark secrets and strange parallels with the events of 1879. Shortly after this heart in mouth opening chapter, the reader is transported to 2015 to meet Fiona Craig and her son James. Fiona is having a similar problem to Ann – except instead of a train disaster her partner, Peter, has done a runner – when she went to sleep he was there – when she woke up he was gone along with the contents of their bank account; she was now destitute. Fiona moves back to her parents’ house in Dundee. Both women have lost their men and now have to fend for themselves and their fatherless children. Both women start to investigate where their men have gone, because Ann very quickly has reason to believe her husband was not on the train and, like Peter, has done a runner. The two different plots of THE LAST TRAIN twist and turn and occasionally there is a modern day link to the activities in the past. I like how the author linked the events and locations from the past into the present, so questions asked in 2015 are answered for the reader in 1879. The overall feeling of the book is one of intrigue – what has happened, is happening and is going to happen? What are the hidden secrets and how will it end? The resolution is not cut and dried for either of the two women – the ending of the modern day plot felt a bit rushed and out of the blue – but when joining the dots it did make sense and fitted the overall mood of the book. Sue Lawrence has obviously done meticulous research into the train disaster and brings it alive on the pages Dundee in 1879 is a mill town full of overcrowded company owned tenements where badly paid cold, hungry, and dirty factory workers live. This is contrasted to how the rich live – and emphasises why Ann fights to keep her comfortable life. Both of the men were utter horrors and both women deserved better. Ann was a strong character – she loves her children and their well-being is one of her motivations, but she is also vain, an utter snob, kept to herself and was a hard taskmaster to her servants. There is a reason for this however, and the reader gets to find out what that reason is. In contrast, Fiona is a bit wishy washy when compared to Ann. Ann had no one to help and had to use her wits – Fiona had parents to help her and a plethora of friends to advise and help her while she searched for Peter. I preferred the historical parts of the story – they had more atmosphere, more mystery, and more angst for the lead lady, I could understand her motivation. I did not get as involved so much in Fiona’s story – and didn’t understand her motivation for chasing up Peter’s past – I would have just moved on. Overall, this was one hell of a story – and as I said in my opening, I really, really enjoyed it. With thanks to Allen and Unwin and the author for my copy to read and review. Opens: Although it was spring, it was freezing cold sitting on the stone steps leading up to our flat. Blurb: London, 1942: Thirteen-year-old Nell and five-year-old Olive are being sent away from the devastation of the East End. They are leaving the terror of the Blitz and nights spent shivering in air raid shelters behind them, but will the strangers they are billeted with be kind and loving, or are there different hardships ahead? As the sisters struggle to adjust to life as evacuees, they soon discover that living in the countryside isn’t always idyllic. Nell misses her mother and brothers more than anything but she has to stay strong for Olive. Then, when little Olive’s safety is threatened, Nell has to make a decision that will change their lives forever…They must run from danger and try to find their way home. My Thoughts: THE RUNAWAY CHILDREN is narrated by Nell and although she is 13 at the start the story spans 4 years and both she, and her sister have to do a lot of growing up fast. Being the eldest child Nell has a huge amount of responsibility taking care of her younger brother and sister. However, when a new baby arrives Nell realises that worrying about four children is detrimental to her mum’s health so agrees to be evacuated to the country. Her brother refuses to go and runs off just as the train is leaving so it is just Nell and her 5-year-old sister Olive who head for the country. I loved Olive – she was a plucky little girl who swore like a trooper and had a mouth that just ran away with her – she made me really laugh out loud at times. The girls are sent to Wales and settle very happily with a minister and his wife. But fate gets in the way and the girls have to go to another placement and this one is terrible. It is from this place that the girls flee and decide to head back to London. It is very obvious that Sandy Taylor has done a study of the plight of the evacuees and she shows the mixed fortunes of the refugee children and how some were lucky with who they moved in with, and others were not so lucky and placed into situations where they were abused. The organisers who placed the children into care were so overwhelmed by the numbers of children they had to place that they did little more than drop them off at the front door and often not follow up on how the children were going. This was a really, good story and no matter how bad things got the majority of humans pulled together and helped each other out. The closeness of the girl’s London neighbours was a prime example – when the bombs started dropping you all got each into the shelter and then kept each other’s spirits up. In fact wherever the girls went – in that time of war – people pulled together , with a few exceptions. THE RUNAWAY CHILDREN was my first Sandy Taylor book and she has been contracted to write more books for Bookouture Publishing – so while I wait for those I have the Brighton Girls trilogy to catch up on. A – Excellent Stuff – a real page turner and hard to put down. I carved out extra reading time just so I could finish it. This book got carted into the bathroom with me, read over meals, read at work, and/or kept me up late at night. With thanks to Bookouture and the author via Netgalley for my copy to read and review.